The Five Fields, a small Chelsea restaurant with room for only 40 diners, has big aspirations to create a fine dining room with a sense of fun. The team behind it certainly has strong credentials. Young chef patron Taylor Bonnyman comes from the two Michelin-starred Corton in Tribeca, New York, head chef Marguerite Keogh, was formerly at Marcus Wareing at The Berkeley, and pastry chef Chris Underwood is ex Tom Aikens. The restaurant's manager, Matthew Widdowson, comes from Bluebird and general manager Rob Kihlstrom worked at the three Michelin starred Eleven Madison Park. Rather than a starry chef barking orders, this is very much a collaborative team effort, with a modern menu mixed with classic French cooking making good use of seasonal ingredients including rare herbs from their own East Sussex herb and vegetable gardens. The Five Fields gyms, sporting activities, health & beauty and fitness. 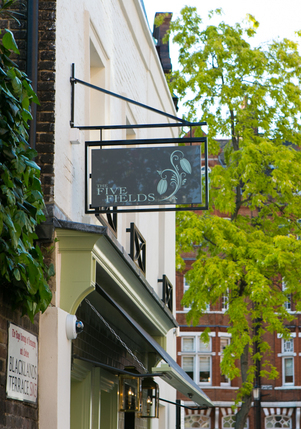 The best pubs near London The Five Fields. The Five Fields clubs, bars, cabaret nights, casinos and interesting nightlife. Where to have your meeting, conference, exhibition, private dining or training course near The Five Fields. From cheap budget accommodation to luxury 5 star hotels see our special offers for The Five Fields hotels, including Sloane Square Hotel London from 86% off.